Red Raspberry Leaf is the herb of choice for pregnancy and for women’s overall health. It’s the best single herb that we can take for total uterine health. Aronais (aka aroniaberries, chokecherries), elderberries, and red and black currants are superstars in the world of berries, and are even better nutritionally than blueberries. Their ORAC scores are some of the highest known. We grow these three berries because of their ease of cultivation but especially for their health benefits…. 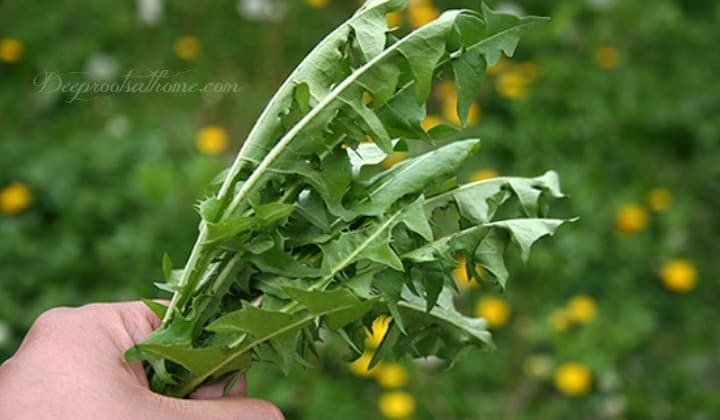 We made dandelion greens tonight for an early spring dinner, and I thought I would share directions with you. You may have never thought of eating (or drinking as a tea) the leaves of dandelion plants but they are incredibly nutritious. If prepared properly, the leaves also makes a fine tasting dish. When the old timers made their spring tonics the main ingredient was dandelion. Dandelion is a diuretic and liver stimulant, restoring the system after months of a more sedentary lifestyle during winter weather. Our very spry and alert 94 year-old neighbor Mary told us that eating spring dandelion greens had kept her healthy and strong all these years…. If you have never grown garlic…why not? It’s a very ‘independent’ thing to do. We are slowly disabled when we become dependent on others. One of the best ways to be part of the solution is to decrease our needs from the grocery and the pharmacist, which bring questionable goods in from long distances. A MORE sustainable means of acquiring food is to purchase locally. The BEST way is to grow your own organically. Garlic needs no chemicals since there are virtually no pests. I’ve had my eye on this nearby mullein plant for 2 months waiting for it to flower. New flowers open up each day. Mullein makes a very appropriate first herbal ally for beginners in herbcraft. In the 19th century, people smoked mullein leaves or dried flowers to treat respiratory diseases, coughs, and asthma symptoms – a practice borrowed from the Mohegan and Penobscot Indians. Mullein is an Old World plant, where it was for centuries an esteemed medicinal herb. The colonists planted it in their gardens; it has since escaped and become naturalized in various species throughout the United States…. This elderberry tincture post is starting out as a difficult one to write for some reason. I want to communicate what I am thinking about self-sufficiency, but know I am a long way away myself. This is to encourage us all in doing anything we can to be more homegrown in our outlook. As a society we have gone outside the home for most of what we need and want in our lives.